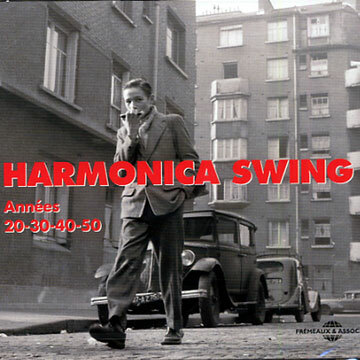 "Harmonica swing années 20 - 30 - 40 -50"
Max Geldray (1939) Mouth organ swing n° 1• Hubert Giraud (1941) Dinah • Dany Kane (1943) Agatha rythm (I got rhythm) • Larry Adler (1938) Lover, come back to me • Borrah Minevitch (1935) Limehouse blues • Dany Kane (1947) C Jam blues • Max Geldray (1947) Ain't she sweet ? • Quintette Dupont-Durand (1939) Organ grinder swing • Dany Kane (1943) D.K. rythme • Max Geldray (1940) Blues • Dany Kane (1947) Cement mixer • Larry Adler (1936) Goody goody • Max Geldray (1946) Sleepy town train • Dany Kane (1941) Fantaisie en do majeuse (sic) • Larry Adler (1935) Sophisticated lady • Dany Kane (1943) Detty • Les 5 de l'harmonica (1942) Pot-Pourri n° 2 • Larry Adler/John Kirby (1944) Begin the beguine • Dany Kane/V. Morgan (1950) Dany smokes Virginie • Dany Kane (1942) Le premier rendez-vous • Dany Kane (1948) Ornithology • Les 5 de l’harmonica (1941) In the mood • Borrah Minevitch (1952) What is this thing called love ? • Larry Adler (1935) Tiger rag • Dany Kane (1943) On the sunny side of the street • Les 5 de l'harmonica (1941) Crazy rhythm • Quintette Dupont-Durand (1938) Nightfall • Borrah Minevitch (1934) Nagasaki • Larry Adler (1937) They can't that away from me • Dany Kane (1943) Divine Biguine (Begin the beguine) • Borrah Minevitch (1934) Bugle call rag • Borrah Minevitch (1933) The ghost walk • The mouth organ Swingers (1951) Steppin' out • Borrah Minevitch Vagabonds (1929) The viza blues • Hotcha trio (1952) Blowing the rag • Trio Marnhy (1952) Le train • Borrah Minevitch Vagabonds (1929) Jolly elm swing • Larry Adler (1936) You hit the spot • Hotcha trio (1952) Twelfth street rag • Dany Kane (1948) La vie en rose • Max Geldray (1946) There I've said it again.